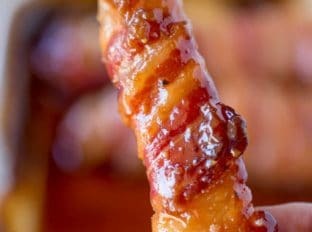 Bacon Brown Sugar Chicken Tenders with just five ingredients and 30 minutes these are the PERFECT gameday treat! A sticky, sweet, salty, crunchy appetizer. Triple this Brown Sugar Chicken Tenders recipe, I promise they’re that good. You won’t even miss the breading in most chicken strips because instead you have CRISPY BACON. Plus its sweet and sticky and bacon-y. Want it a bit spicier? Add in 1/4 teaspoon of crushed red pepper or a squirt of Sriracha. If you want an even deeper caramel flavor, try dark brown sugar. Serve with ranch dressing or honey mustard for dipping sauces. Have lots of paper towels to save smears from your couches as people are watching the game. If you’d prefer to make this with boneless thigh meat cut the thighs in three strips. 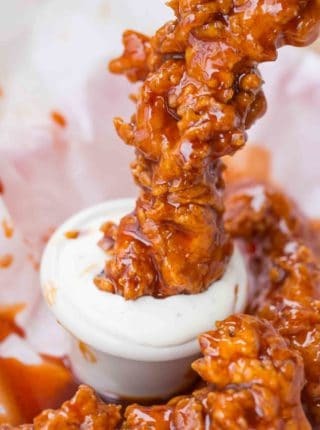 You can also cut your chicken pieces into bite sized chunks and cook them off as bites (I am making these for the next Dodgers game and I will snap some pictures!). 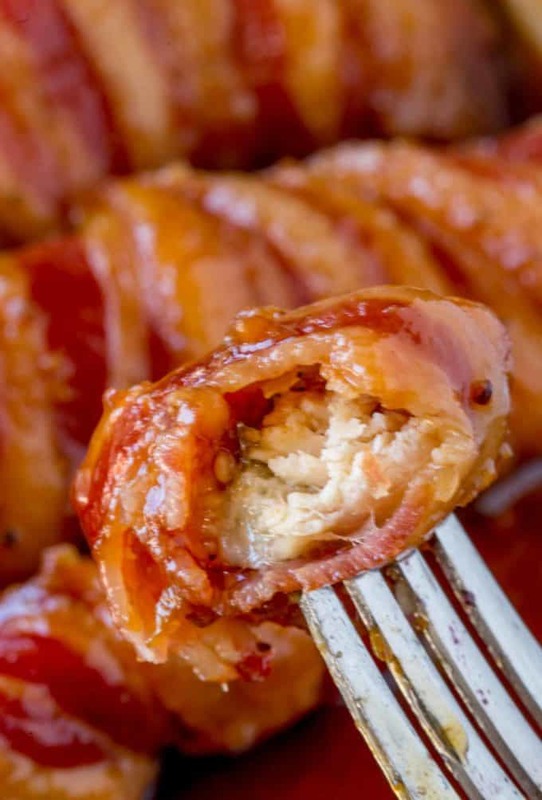 Chicken Fire Poppers – PS These are the PERFECT recipe to make with these tenders. Cut each chicken breast into 4 long, thin chicken strips. In a bowl add the brown sugar, salt and pepper. Add the chicken tenders and toss in the brown sugar. 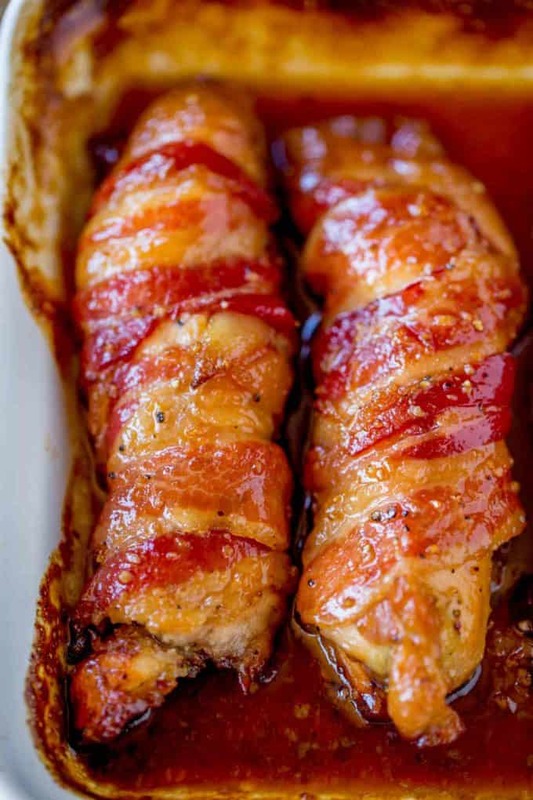 Wrap the chicken in a strip of bacon and put into your baking dish. Sprinkle over the remaining brown sugar. 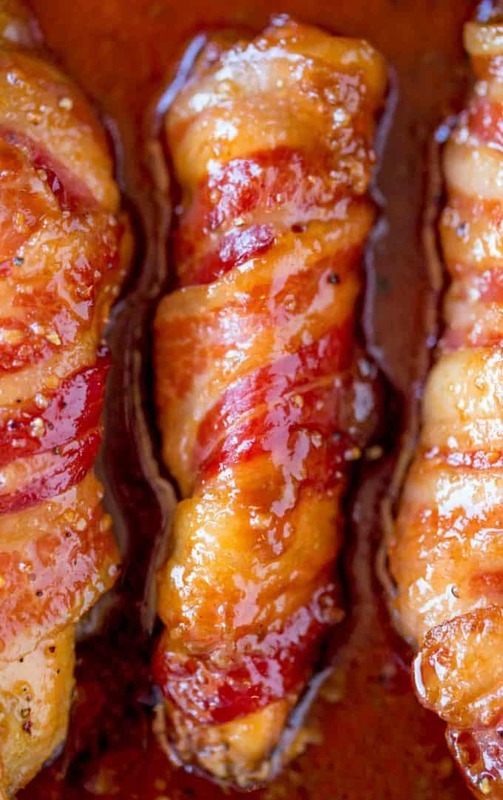 Cook for 20-25 minutes or until bacon is cooked through and crisp (as pictured). 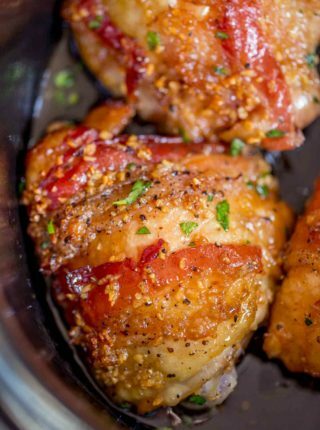 Can I use boneless chicken breasts instead of thighs? How would you do this in an Air Fryer. I think I will try it tonight. Looks yummy. I’ve never tested it using one so I’m not comfortable giving a recommendation. You might be able to find a recipe online with similar ingredients using an air fryer and follow that as a guideline. Good luck! AMAZING MY WHOLE FAMILY LOVES THEM! I make them ALOT for dinner! Thanks so much! We will be making these for a second time! My family loves it! We make it a meal with some homemade mac and cheese and steamed broccoli for sides! Delicious! So glad you all enjoyed it, Sarah! Thanks for the 5 star rating. Do you cover with aluminum foil? Trying them for the first time. No, I didn’t cover mine. I hope you enjoy them! I use a 9×13 glass baking dish with non stick foil lining it. My chicken was swimming in bacon fat and brown sugar soup! The brown sugar did not carmelize and just melted into the fat. Maybe cooking on an elevated grate on a deep sided cooking sheet would work better? It still tasted fine but was really hoping for that sticky carmelly goo to lick off my fingers…lol! Glad a tried recipe before a party. I will try again…wish me luck! Yes, try elevating it up. That should help keep it out of the moisture that’s released. Good luck! Made with a tbsp of Mike’s Hot Honey added to the brown sugar mix and it was amazing! Sounds amazing!! Thanks for the 5 stars! Really easy to make ! Awesome combination of ingredients. Taste soooo good. The recipe popped up on my Social Media feed and I gave it a try. Happy I did. Yay!! I’m so glad you enjoyed it. Gotta love social media!! Im going to put cheese in middle of chicken, cant wait to try. Just cant decide what kind of cheese. Made these for a dinner party. After baking I cut them into bite size pieces. Served with a simple homemade sweet/sour sauce. 1/3 cup honey. Simmer until reduced to dipping consistancy. They are awesome I love it! My husband love it!!! Made the brown sugar chicken bites, added chili powder to the brown sugar. Family loves them. Make every Super Bowl. It’s the first thing to go. We made this tonight and it is very good and we will be making this again. What would you serve with it, if using as a main dish? I love roasted vegetables or potato wedges. Enjoy! what would be the difference in cooking time for doubling or tripling this recipe? Just make sure not to overcrowd the pan as that will affect the cooking time. It might take an additional 10-15 minutes or so. You’ll be able to see when it’s done. It sounds like your chicken released more liquid than mine. You can elevate it by placing it on tin foil or a cooking tray so it’s not sitting in the liquid next time. Enjoy! Making these bad boys tonight! Can’t wait!!! I did this in a foil pan on a covered outdoor grill and turned them about half way thru. So simple yet so good. This recipe is a keeper! I made this with sausage at our last family gathering and they were a huge hit… the whole tray was devoured in minutes… my husband keeps asking me to make more so I’m thinking I’ll try this version this time 🙂 hope it’s just as yummy! .. the only thing the sausage recipe had different was a few dashes of course mustard, the tangyness was great. Also I cooked it in the crock pot on low over night, only gently stirring a few times. I’m going to stick to the same recipe as before but use chicken instead. Hope it works out 🙂 thanks for this recipe, it sparked my imagination to try something new with an old recipe. Thanks for sharing, Crystal! I love when my recipes inspire my readers to come up with their own creative ideas! omg Amazing And Very delish Thanks for the Recipe ? You’re welcome Kerry! Glad you enjoyed it! Made these today. Added red pepper flakes. My family loved them. I made this and it is delicious wife approves a little tip when your chicken is done if you want a little crispy bacon turn on your broiler and perfect also I made homemade honey mustard dipping sauce with Cayenne pepper! The tenders might have created too much liquid during the cooking process. Next time, you can try elevating them by placing them on a cooking rack or ball up little balls of foil. I’m not sure, it couldn’ve been the thickness but next time you can always pop it under the broiler to crisp the bacon more in a quicker time. Hope this helps! Is there any nutritional information on this recipe. I need to know the amount of calories, grams of sugar and carbs. I plan on making these for my friend’s 11 year old son who was recently diagnosed as type 1 diabetic. Looking for low carb recipes to make for him to eat. I think he would really love these — they look YummY!! Thank you for any info. you can give me!! Sorry I don’t have the nutritional facts for recipes on the site but I know there are a lot of free resources on the internet from when I’ve cooked for clients with low carb diets. can i bbq them instead of oven? 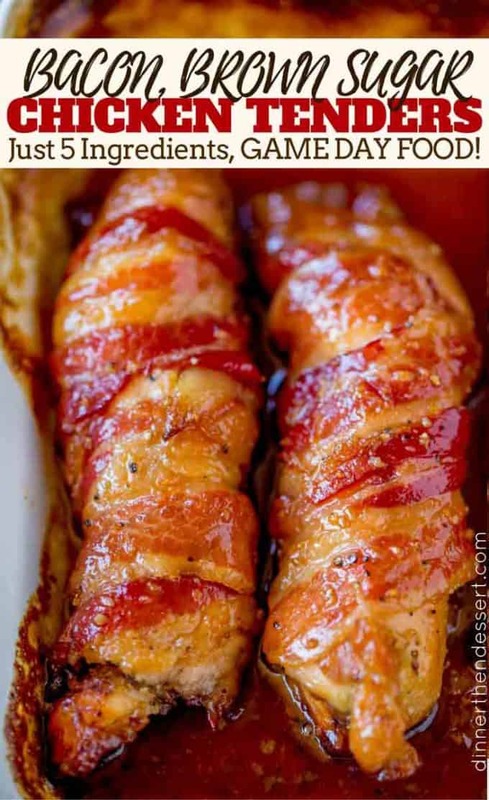 I know the name is not such a big factor, as is the recipe itself, but isn’t it technically Bacon-WRAPPED Brown Sugar Chicken Tenders? Looks very good, and I think I will mention it to a good friend of mine, and see if they will make it for me; in fact, I will print out the recipe for them. Thanks for this idea! Yes, it came out really good. This recipe is amazing. I added red pepper flakes to the brown sugar mixture just to give it a little spice. Absolutely amazing. And easy to prep!! Thank you for this recipe!! Also, I did put my chicken on a rack inside my pan to make the bacon a little crispier. Joy, those are fantastic ideas to make a spicier version and make crispier bacon! Thank you ? 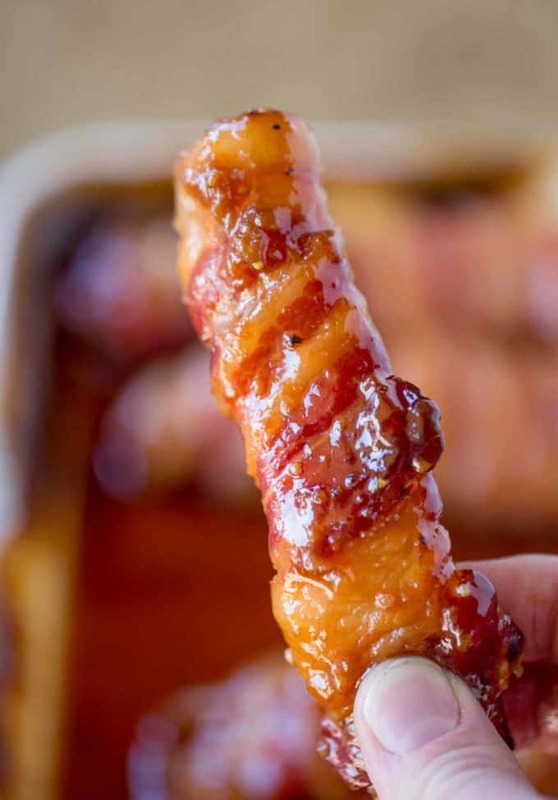 Gorgeous, I also brushed mine with a touch of Maple Syrup before sprinkling with the left over sugar, helps the bacon crisp up and gives that extra little yummyness. Super delicious! my family really liked!!! I’ve been making this for years. It’s so delicious! We had it for Christmas dinner last year, with twice baked stuffed potatoes and blue cheese salads. Amazing. My granddaughter’s are coming tomorrow and have already y requested this! I love it! Thanks for letting me know! These were super delicious but my bacon wouldn’t get crispy. Is there a trick to it? So glad you enjoyed the taste! You can always place them on top of balled up foil or place a baking rack on top of the sheet pan so they sit a bit higher to crisp up. Just made them and had same problem with bacon not crispy. I put the broiler on high for a couple of minutes for each side and bacon got nice and crisper. I had used a cooking rack which raised the chicken away from the bottom of the pan. These were very good. I added crushed red pepper flakes for a little sweet heat. My bacon didn’t get crispy, though ? I’m so glad you enjoyed it! Sounds like the tenders might have created too much liquid. Next time, try elevating them by placing them on a cooking rack or ball up little balls of foil. They would be amazing with just about anything 🙂 I like macaroni and cheese or my rainbow roasted vegetables as sides for this. What did you end up putting with it? I am doing cheesy bacon fries. I’m making these for the second time in a week. My family loves them. They are great! I’d definitely call that a winner! Thank you for coming back to let me know! These are so easy to make and really good. I made them just for a quick dinner and had plenty leftover but I used the chicken strips already cut so you may have to use two pieces of bacon. Oh my gahhhhhh! These look amazing! You’re welcome, Steve! Glad you enjoy it! 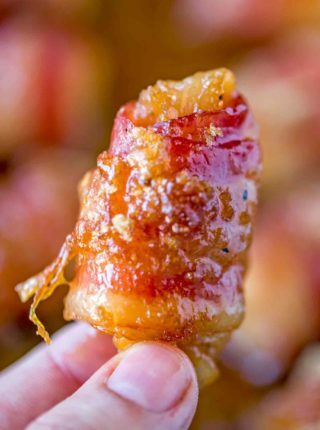 I love candied bacon. I can’t wait to wrap it around some chicken!! Gimme! These are happening Sunday! Mmmm doesn’t get any better than BACON!!! I agree they r awesome !